GATE Paper Analysis:During preparation of GATE Exam, collects details like the type of questions asked, total marks, marking scheme, and the number of question papers. Being familiar with GATE exam pattern 2018 will enable the candidate to prepare better as the candidate can then formulate separate strategies to tackle different question types. 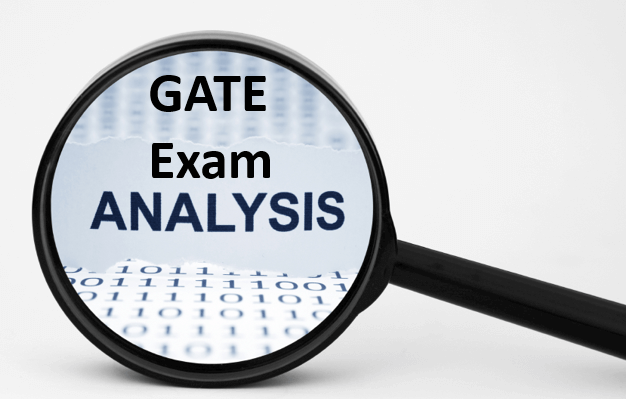 In this article you will get the complete information about previous year GATE exam analysis. GATE 2019 Exam Dates has been released, Click Here for more information. In GATE Exam, there are two types of questions pattern- multiple choice questions (MCQs) and numerical answer type (NAT) questions. As per the exam pattern of GATE 2018, the exam would be computer-based of three hours duration, comprising 65 questions. Last year, IIT Roorkee organized Graduate Apptitude Test in Engineering (GATE) in online mode for 23 papers. The present exam organizing authority, IIT Guwahati, has not added a new paper or removed an existing one for the upcoming session. Candidates are allowed to sit for only one paper. During the online exam, the candidates will be given a computer, with questions being displayed randomly on the computer screen. The candidate must select the right answer for the questions for MCQs, while for the numerical type of questions , the candidate has to enter the numerical answer by using the mouse on a virtual keyboard. Keep reading to learn in detail the Exam Pattern of GATE 2019. No negative marking for numerical answer type (NAT) questions. These are termed numerical questions because the answer to the questions is a real number which the candidate has to enter using a mouse and virtual keyboard. The candidate will not be given any choices for these questions. The question paper of GATE 2018 will hold 85 marks specific to the subject while remaining 15 marks will be from GA. It is mandatory to attempt both the sections. Papers with the codes AE, AG, BT, CE, CH, CS, EC, EE, IN, ME, MN, MT, PE, PI, TF and XE, will include a compulsory Engineering Mathematics section carrying around 15% of the total marks. The remaining 70% of the total marks is reserved for the subject of the paper. In case of Papers with the codes AR, CY, EY, GG, MA, PH and XL, 85% of the total marks will be dedicated to the subject of the paper.